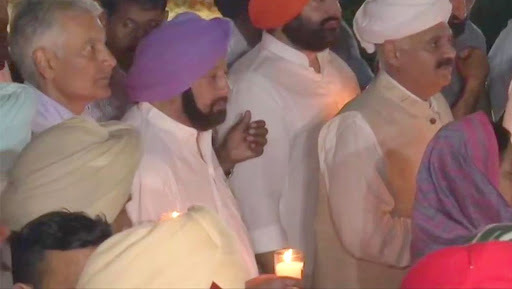 Chandigarh, April 12: Punjab chief minister Captain Amarinder Singh and Governor VP Singh Badnore along with other people participated in a candle light march at Jallianwala Bagh ahead of the 100th anniversary of the Jallianwala Bagh massacre. Tomorrow, April 13, 2019, will mark 100 years of the Jallianwala Bagh massacre. UK PM Theresa May Expresses Regret Over Jallianwala Bagh Massacre. The Punjab government announced last month that it will build a memorial in Amritsar from the soil of 13,000 villages of the state to pay tribute to the martyrs of the Jallianwala Bagh Massacre. The decision was taken during a meeting of Implementation Committee regarding Centenary Commemoration of the massacre. Punjab Chief Minister Captain Amarinder Singh approved the decision. According to local media reports, the chief minister also asked the Deputy Commissioner Amritsar to identify a strategic spot in the city, where a suitable memorial could be erected. Jallianwala Bagh Massacre Centenary Commemoration: Punjab Government to Build Memorial in Amritsar With Soil From Each Village. On Centenary Commemoration of the massacre, the Punjab government will organise a grand function on April 13. Captain Singh also directed the Principal Secretary Cultural Affairs to coordinate with all the concerned departments for organising the function.